Dress, Hooped Petticoat and Headpiece. The Queen of Hearts is perhaps the maddest inhabitant of Wonderland and her answer to everything is a beheading ! 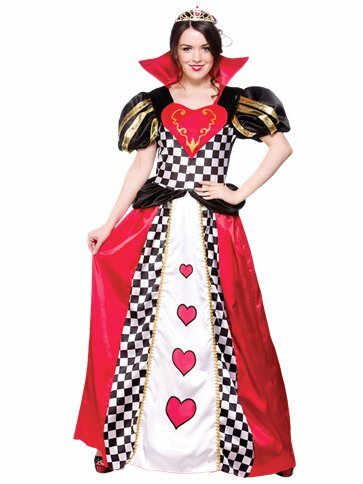 This impressive, Queen of Hearts costume features a full length, satin dress with heart print and large padded collar. The final touches to this storybook costume include a hooped petticoat and a gold coloured tiara with gem appliques. Its all you need to add to transform into the tyrannical and deranged ruler of Wonderland. Want it Friday, 26 April? Order it within 1hr and 59mins and choose Premium by 9pm Delivery at checkout.